← Don’t Just Answer the Question. Habit #7 of Highly Effective Dentists: Sharpen Your Explorer! In Stephen Covey’s seminal book, “The Seven Habits of Highly Effective People,” the seventh habit is described as “Sharpen the Saw.” In the book, “sharpen the saw” is a metaphor for self-improvement. In the case of your professional development, and specifically in dentistry, it could be interpreted as improving your clinical skills or knowledge. Taken more literally, if you’re a carpenter or lumberjack, it could mean… well… literally sharpening your saw. Sharpening your saw, means you’ll make more efficient and more precise cuts. That not only improves your results, it could increase your productivity / income. Speaking for myself, I have to admit literally never sharpening my explorers. In the past, when they got impossibly dull, I’d just buy new ones. But, if I’m being honest, it’s been a LONG time since I did even that. Recently, it dawned on me that my explorers were about as “sharp” as a ball point pen. Looking at them under my Designs for Vision 3.5x surgical telescopes, I could no longer deny it. Just buy some new ones, right? Click on image for EasyEx website. I thought I’d just order some new explorers. Then just the other day, I saw an ad (on Facebook, maybe?) for a gizmo designed to sharpen explorers. It’s called the “EasyEx.” It’s a simple, battery-operated power sharpener JUST for explorers. Price is $139. And, at first, I thought, “That’s too much for a simple rotary sharpening stone.” Perhaps it is “too much.” OK… it’s the price of about 10 good explorers (I like Hu-Friedy). But, what is it costing me and my patients, if I’m missing diagnoses with my dull explorers? If I diagnose just one restoration sooner rather than later, it’s paid for itself. I ordered the EasyEx. It arrived yesterday (batteries included! ), and I went to work on my dull explorers. It works! It’s easy and it’s quick! Plus, I breathed new life into my otherwise perfectly good explorers. What a difference! The EasyEx is a battery-powered sharpening stone with a conical recess. It doesn’t just spin on axis. It is an orbital movement. 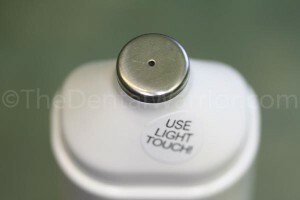 You just stick the explorer tip into the little hole and lightly rock it back and forth. Sterilize your explorer first! The stone is removable for cleaning and sterilization (if needed) and replaceable. Same order as above (dull, new, sharpened), close-up. It’s funny how we dentists focus on the complex intricacies of constant and never-ending improvement. We’ll spend five… even SIX figures to get the latest gizmo “keeping up with the Greenbergs.” Well, some of us might. Meanwhile, we tend to forget the simple (and far less expensive) things that may have an even bigger impact. OK, fellow Dental Warriors… take a few minutes and sharpen those explorers! As always, I have no financial interest in any of these products. I’m just a happy paying customer sharing his experience. 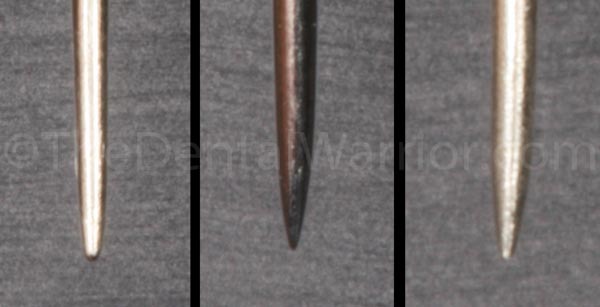 This entry was posted in Dental Product Reviews, Tips & Tricks and tagged dental explorer, EasyEx, sharpening. Bookmark the permalink. 5 Responses to Habit #7 of Highly Effective Dentists: Sharpen Your Explorer! Scratched mirrors, scratched orange paddles….the list goes on…. Thanks for the wake up call! Such an easy tool to improve patient care. I will definitely invest. Thank you! Found your blog/site researching explorer sharpening. 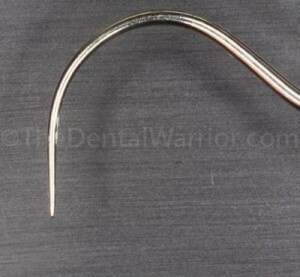 Just purchased a hook file from “Dr. Slick” at LLBean. LOL. Two sided fine/medium grit.